LOCATION This beautiful three storey property is set within an enviable location, close to a host of local amenities. Horsham is a thriving historic market town with an excellent selection of national and independent retailers including a large John Lewis at Home and Waitrose store. There are twice weekly award winning local markets in the Carfax in the centre of Horsham for you to stock up on local produce. East Street, or ‘Eat Street’ as it is known locally, has a wide choice of restaurants ranging from Pizza Express to the Michelin starred Tristan’s. For those needing to commute, Horsham Station, is just a short walk away, and has a direct line to Gatwick (17 minutes) and London Victoria (56 minutes) and there is easy access to the M23 leading to the M25. PROPERTY The front door opens into a generous Hall, which has stairs leading to the First Floor and doors opening to the Living/Dining Room, WC and Study, which is the ideal space for anyone who works from home. The Living Area measures 16’8 x 14’9, has plenty of space for your sofas and a dining table, double doors spilling out to the well kept Rear Garden and a door opening to the stylish Kitchen. This modern space boasts a range of modern floor and wall mounted units with a host of integrated appliances and opens through to the Study, which could also be used as a Breakfast Room. 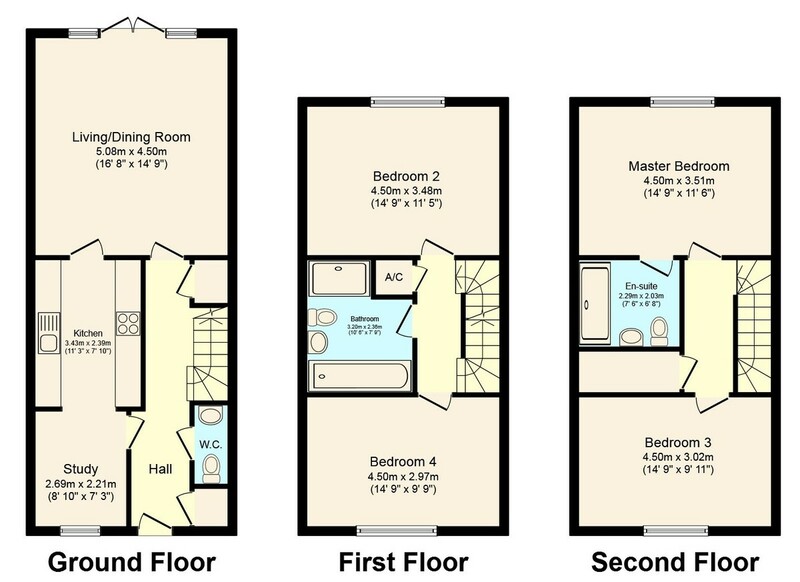 To the First Floor are two of the four impressive double bedrooms and Family Bathroom. Completing the accommodation is the Second Floor with a large Store and the Master Bedroom which has a luxurious En Suite Shower Room and plenty of space for Wardrobes. OUTSIDE This modern three storey family home has two allocated parking spaces which are located to the rear of the property in a nearby car park. The Rear Garden has a block paved patio, perfect for barbecues in the summer months, leading up to an area of lawn, which is ready for the next owner to make their own. At the rear of the garden is a shed, that provides additional storage and a gate that takes you to the parking area.